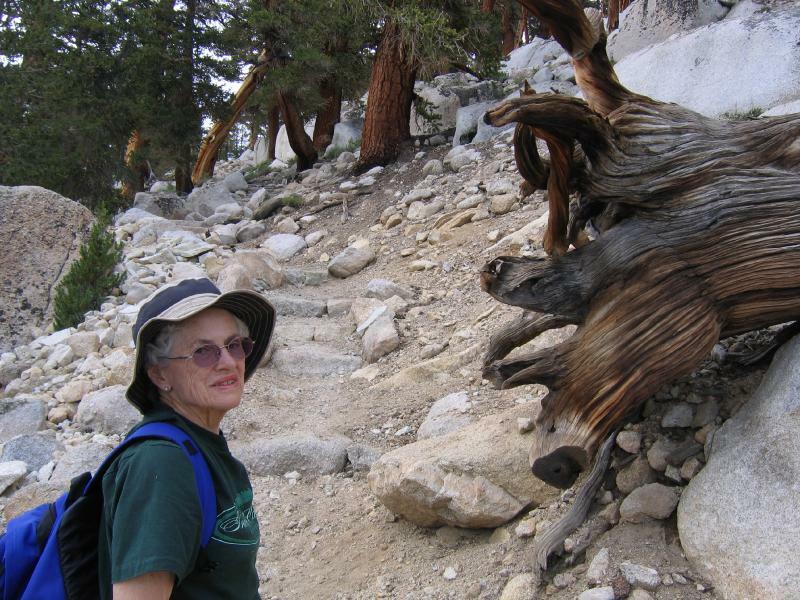 Over the years, as our family was frowing up, we spent many wonderful times skiing, backpacking and hiking in the High Sierra Mountains. 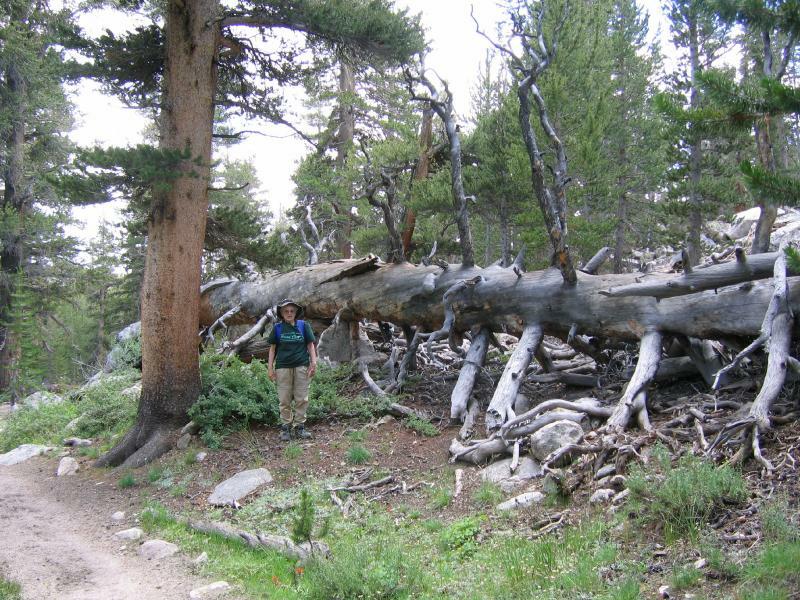 Marie and I yearned to see some of our favorite wilderness haunts again, and so we planned this trip. 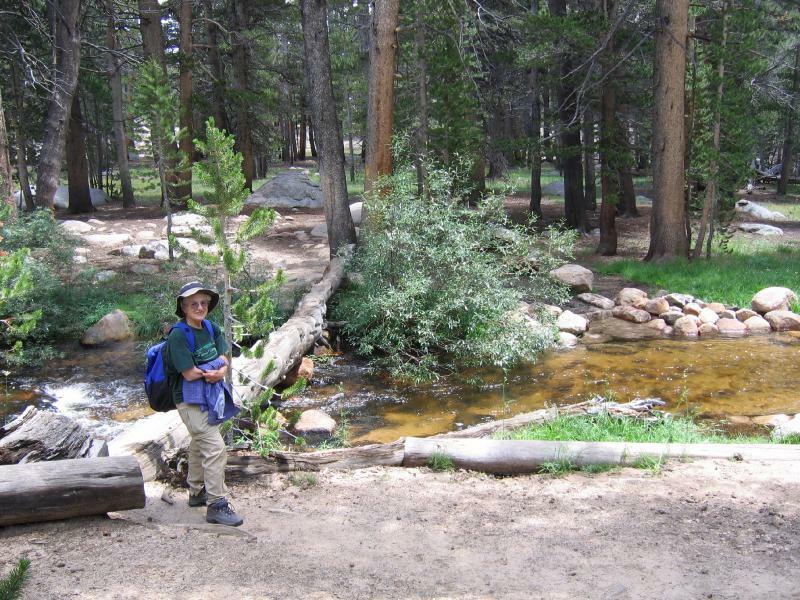 There would be no backpacking with it's attendant heavy packs,cooking and sleeping on the ground,but rather we would embark on "day hike", with light packs, and soft motel beds. Sounds good,huh? 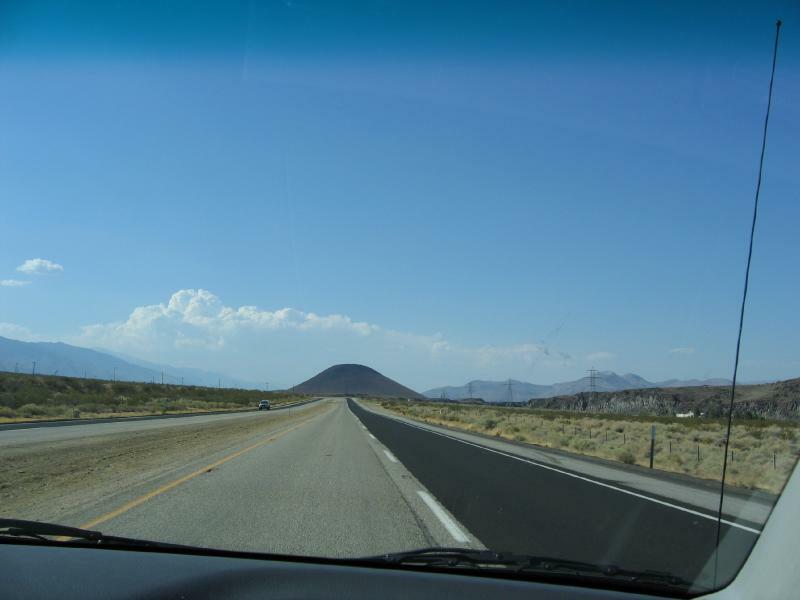 We left home about 11AM on Saturday the 29th of July, and headed north on the 405, then route 14 to Ridgecrest, and then the wonderful 395 to Lone Pine in the spectacular Owens River Valley. While enrout, we saw a sign advertising a Navy Museum at China Lake Navy base, but it was closed when we drove to the base. It sounded like a great place to visit sometime. Here we see the sierras starting to dominate the western skyline. 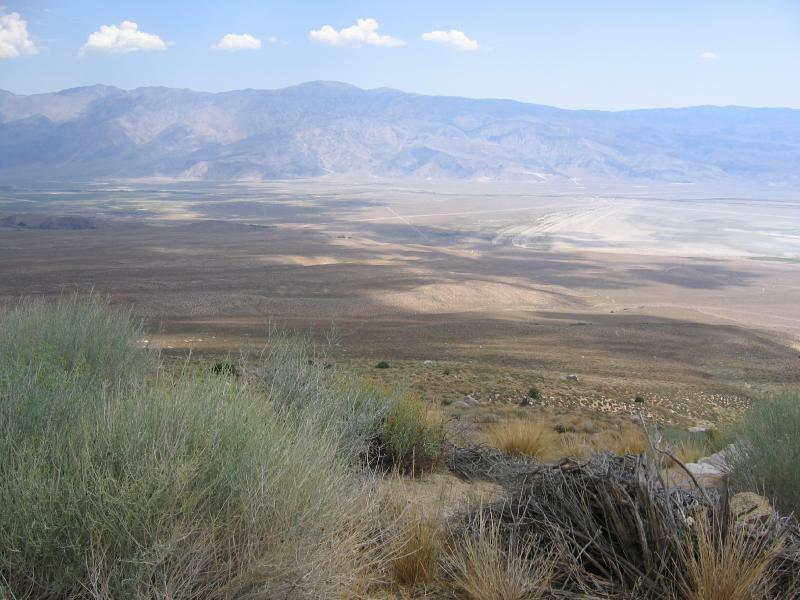 The Owens River Valley is volcanically active, with lots or recent lava flows and cinder cones. Here is one that has been a family landmark since the 60's, and we named it "Mt Pooksie" which was a nick name for Nancy when she was la small child. 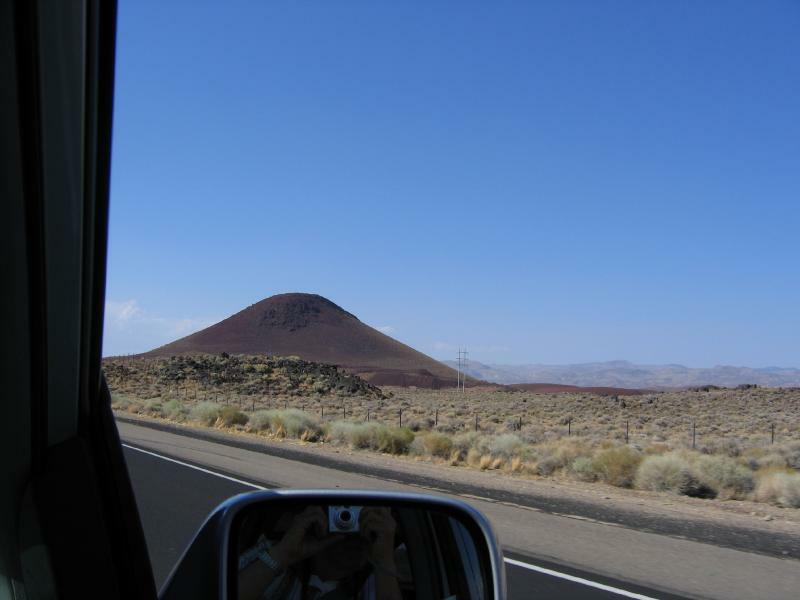 Here is a closerr view of Mt Pooksie, and you can see lava rocks in the foreground. We arrived at the new Ranger Station/ Visitor Center in Lone Pine around 5 pm and we were very impressed by the beautiful buildings. 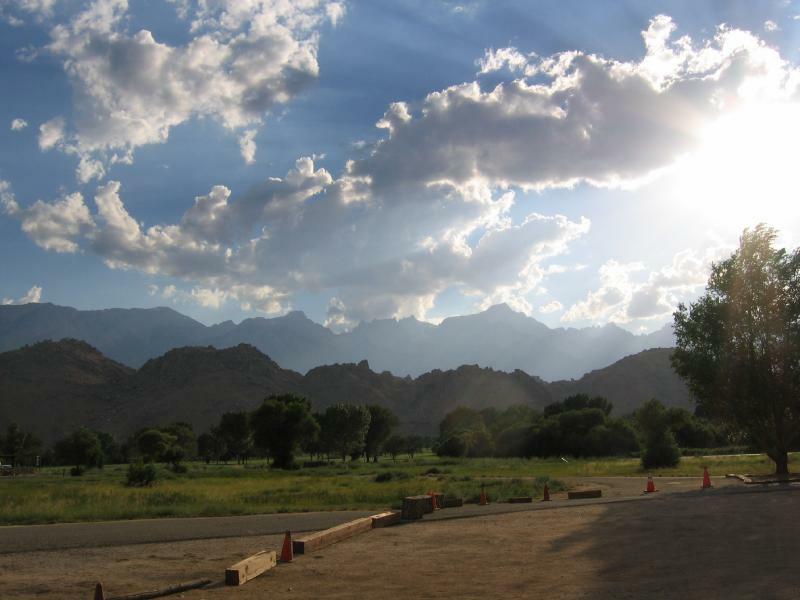 This is a view from the parking lot, looking to the dramatic High Sierra escarpment to the West. 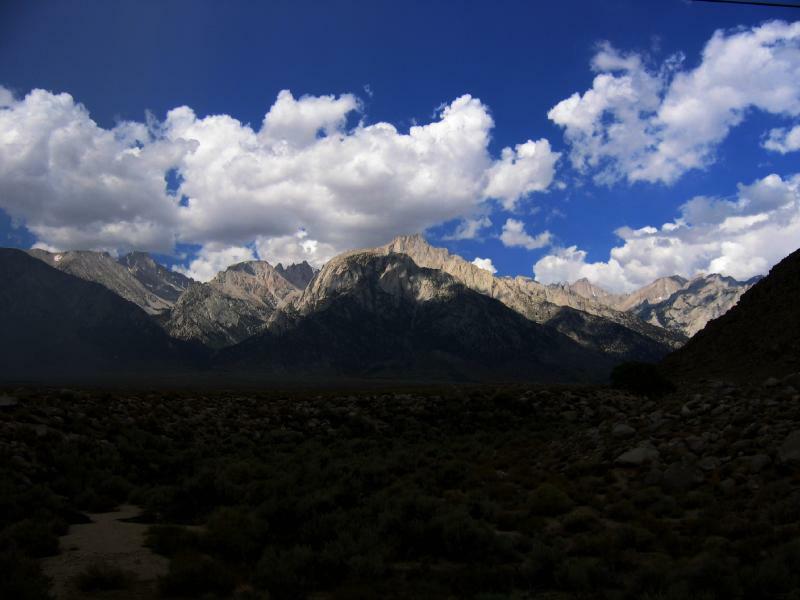 It contains Mount Whitney, at 14,505 feet, the highest point in the contiguous 48 states. As you can see the Sierras rise steeply from the valley floor, which, I think, is about 3800 feet elevation. This is one of the most dramatic escarpments in the country. 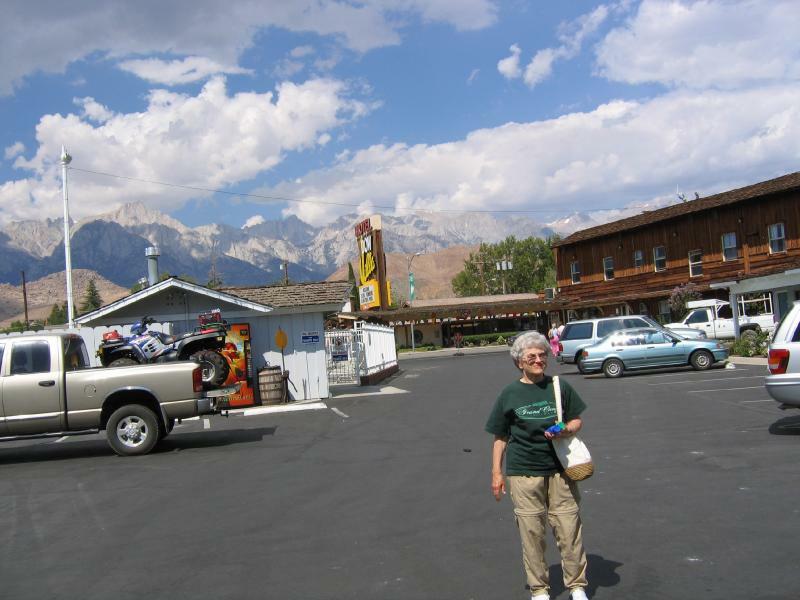 This is our motel, and you can see that the town of Lone Pine is delightfully situated near the mountains, and in fact is known as the Gateway to Mt Whitney. The only traffic light in town is at the intersection of Rt 395 and Whitney Portal Road, which takes one to the starting point for any whitney climb. 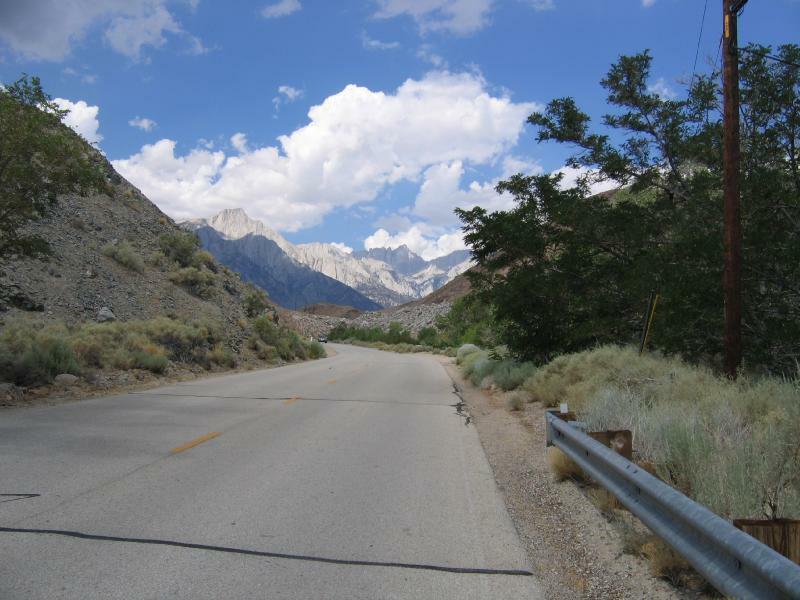 On Sunday morning, we started our drive up into the mountains by driving up Whitney Portal Road, and, luckily, you can see Mt Whitney silhouetted against the white cloud in the center of the photo. 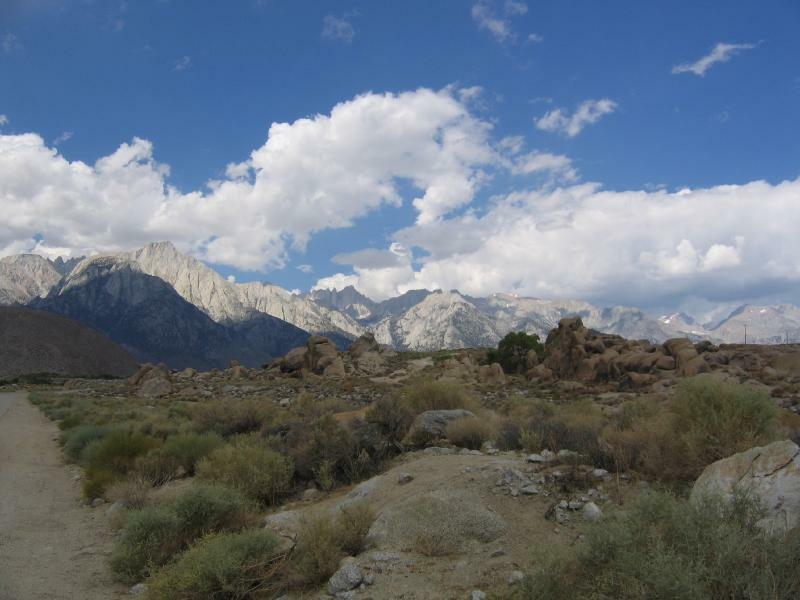 We turned south off the Whitney Portal Road onto the "Horse shoe Meadow road We are driving through an area of low weathered hills, called "The Alabama Hills", and they are the remains of a very ancient mountain range that dominated this area long before the Sierras rose.. The air smelled wonderful with the scent of the sage. 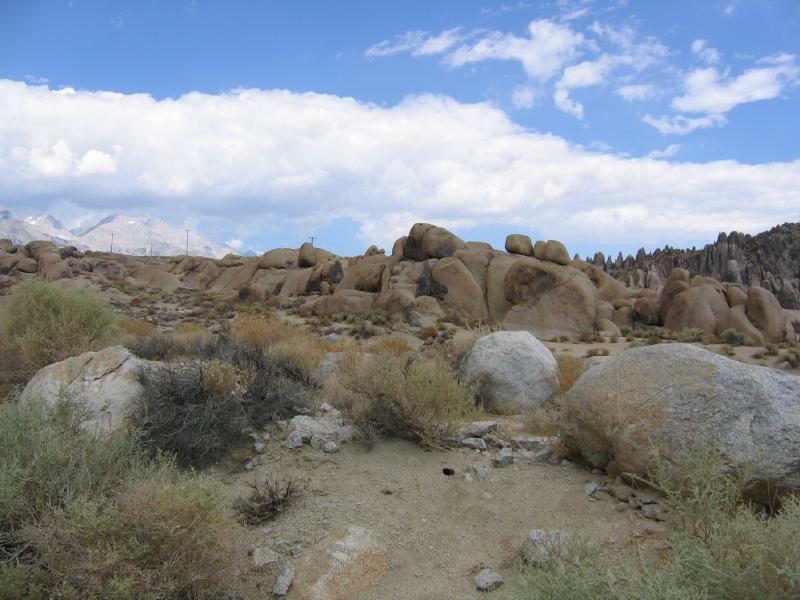 The rock formations of the Alabama Hills are very dramatic and beautiful, resulting in this area being a favorite setting for many hollywood movies. One of my favorite movies, Gunga Din was shot here, representing the dramatic setting in India near the Himalays. I darkened this photo somewhat in Photoshop in order to bring out Mt whitney, which is the highest peak near the center.of the photo. Our road works it's way up the face of the escarpment with many switchbacks, and spectacular scenery. 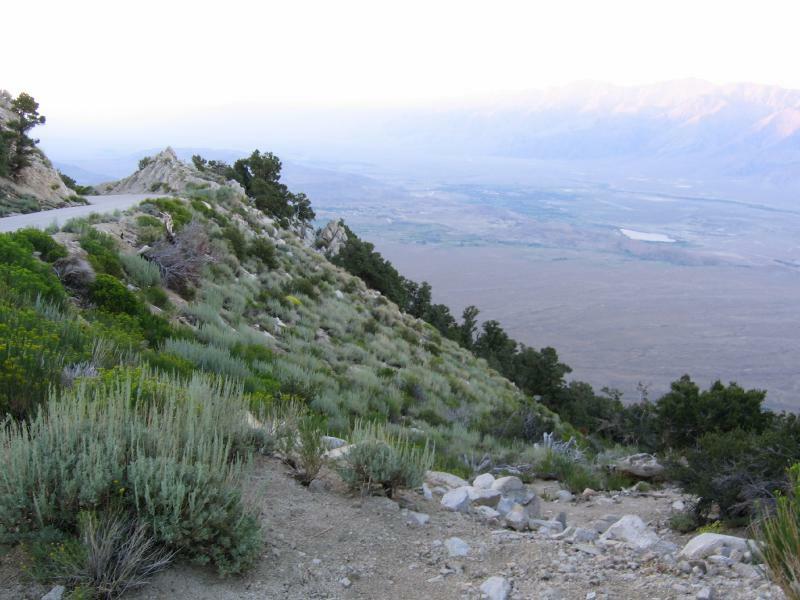 Here we are about one third of the way up the escarpment, and are looking East toward the White Mountains across the Owens Valley floor. 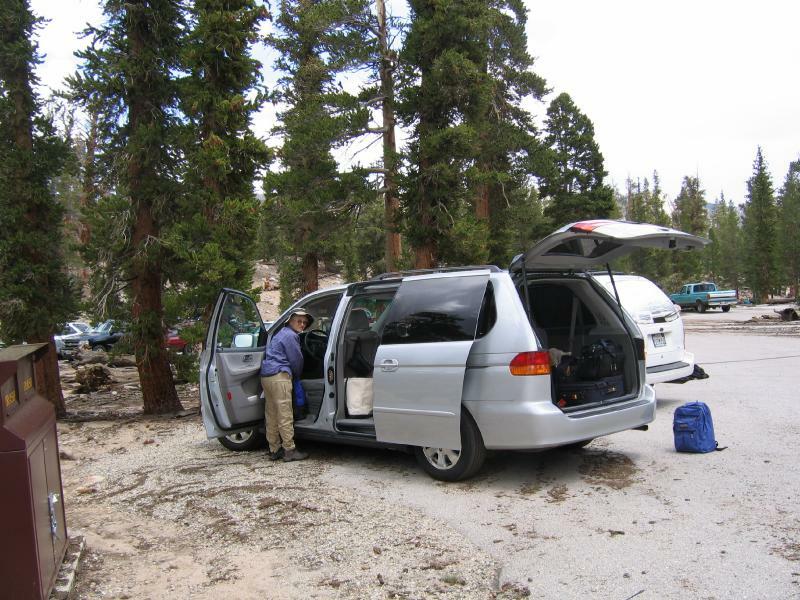 We have arrived at the Horse shoe Meadow Parking area, which I think is about 9500 feet. 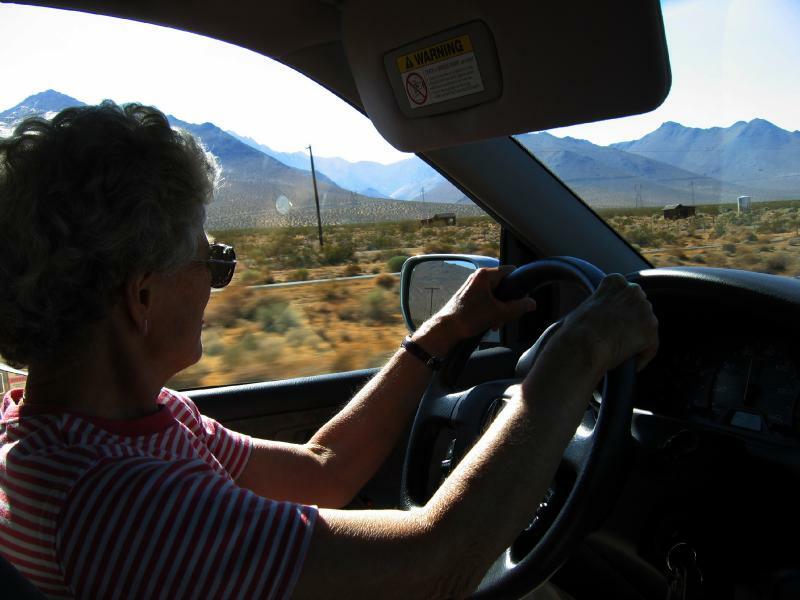 When we came here in the old days the road was unpaved and very rough, and there were no parking lots. 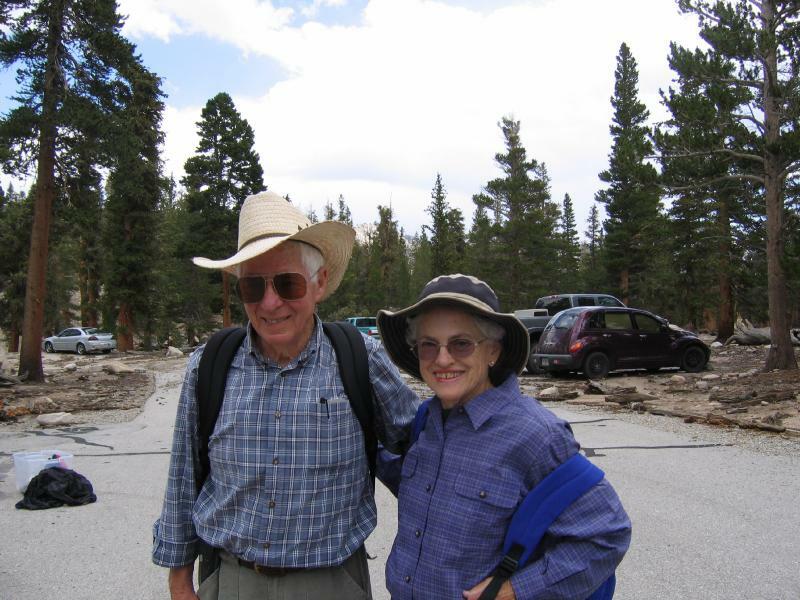 It is about 12:30 and we are ready to start for "Cottonwood Lakes, which the ranger said was about 5 miles away, and about a 1200 foot climb. 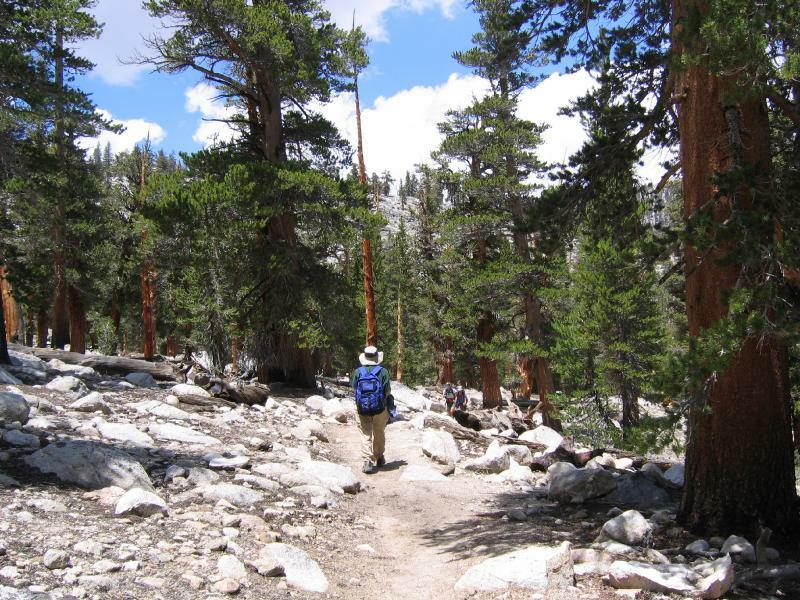 We thought we would walk till we got tired, and then head back, stopping to rest often. Oh how foolish we mortals can be! 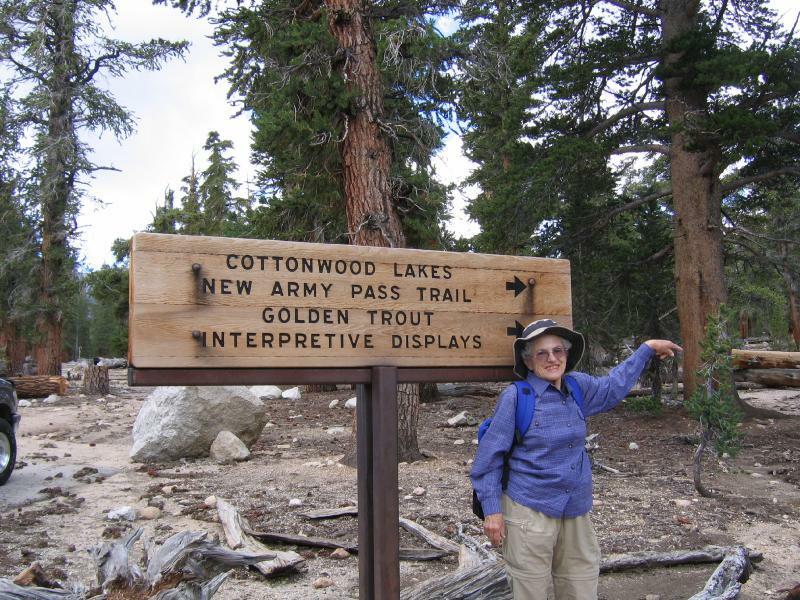 This area is famous for it's Golden Trout. 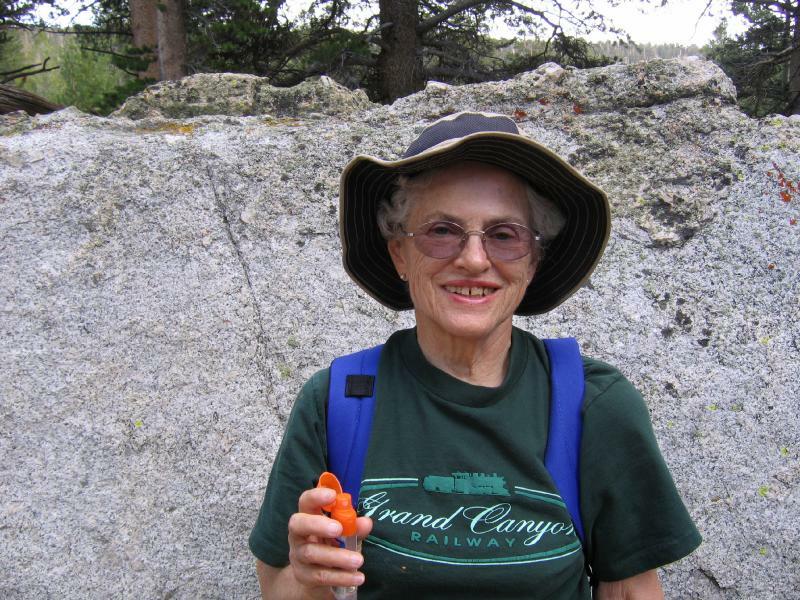 As you can see, the trail has lots of rocks, and, with my poor vision, I had to be very careful. Also, we had not had enough time to get acclimated to the 10,000 foot altitudes. 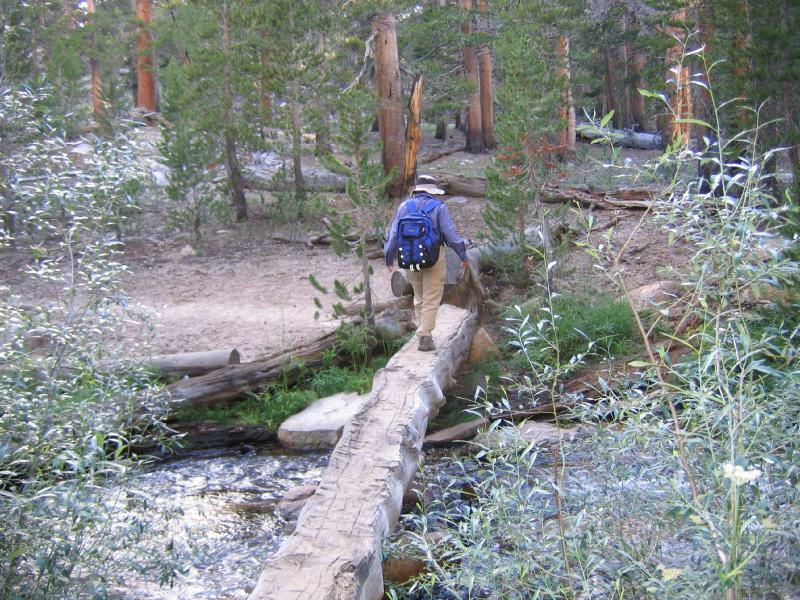 We had to cross two good sized streams, using these logs as a bridge. Marie was great at this. After about one hour we stopped to eat our lunch, and thereby lighten our packs. This stop was about 30 minutes. We saw many huge bolders like this, and wondered what it was like when they had rolled down the hill to their current positions. At this point the mosquitoes started to get bothersome, and Marie shared the repellant. 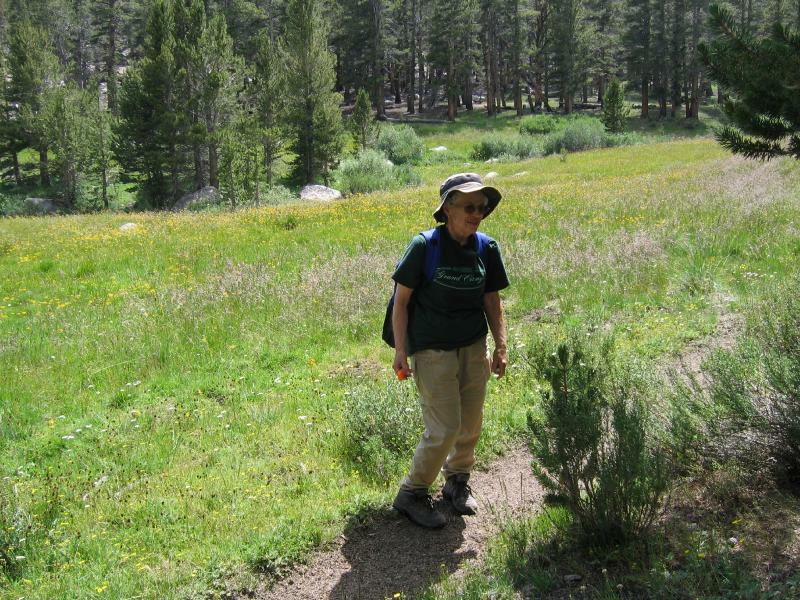 It was an area of beautiful open forests, nice meadows , and lots of rocks. There were many wild flowers, in meadows like this. 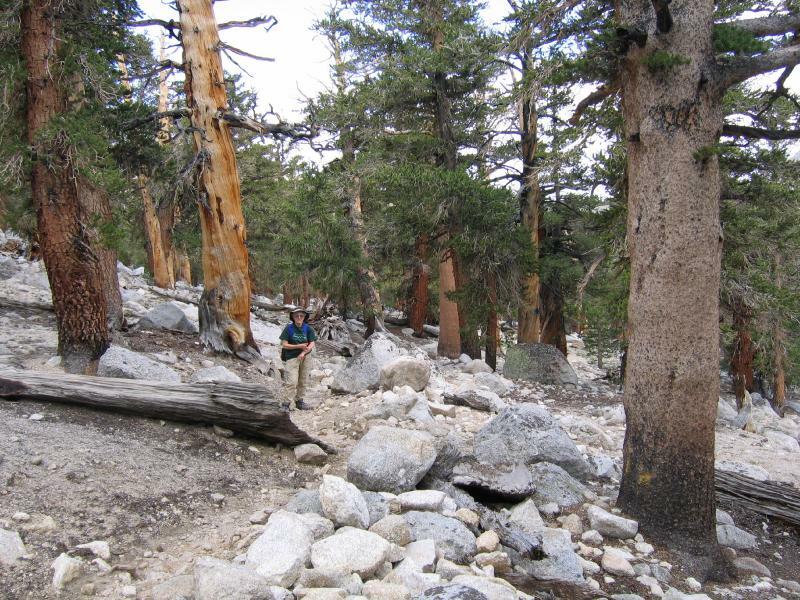 Now the trail is getting steeper, and we consider if we should continue to try and get to the Cottonwood Lakes plateau. We have been walking for about 3 hours. with few stops, since the mosquitoes then find you and easy target. We decide that we will push on. 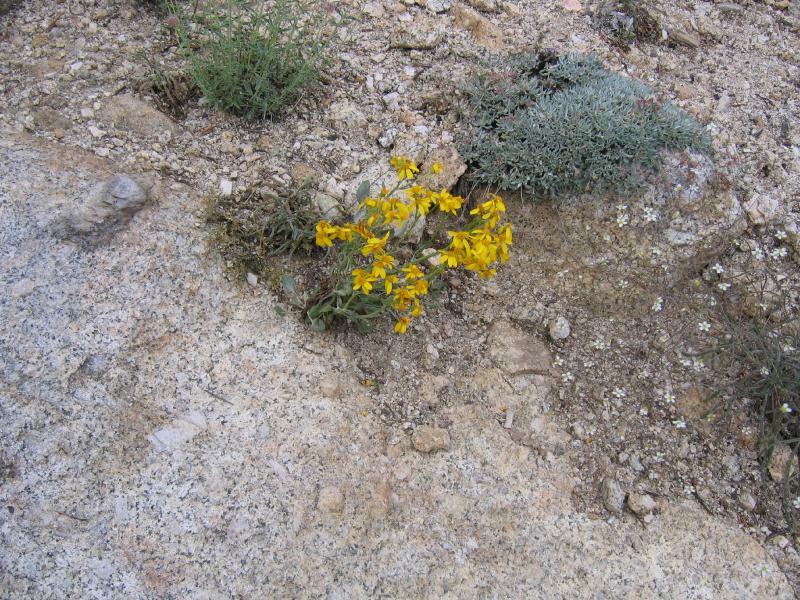 The little flowers that struggle amoung the rocks are often the most beautiful! Hooray! 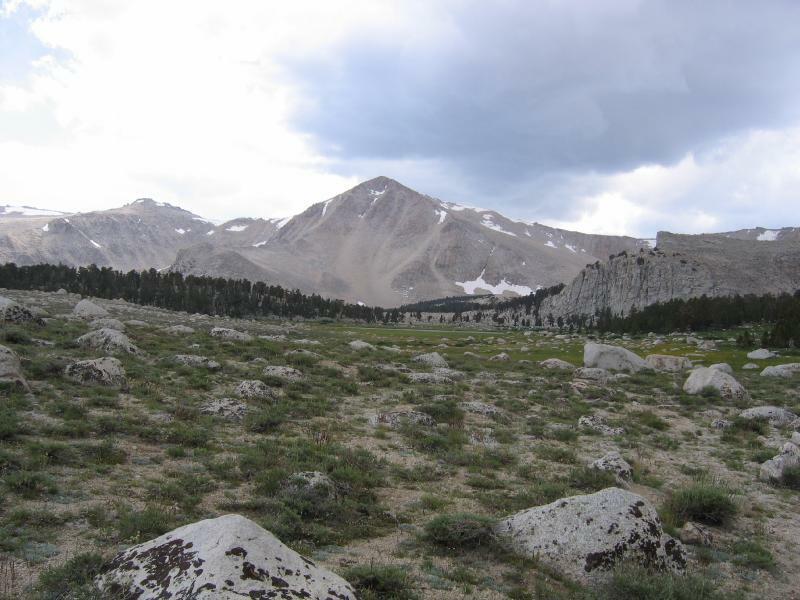 we finally reach the Cottonwood Lakes plateau, which the ranger said was over 11,000 feet. 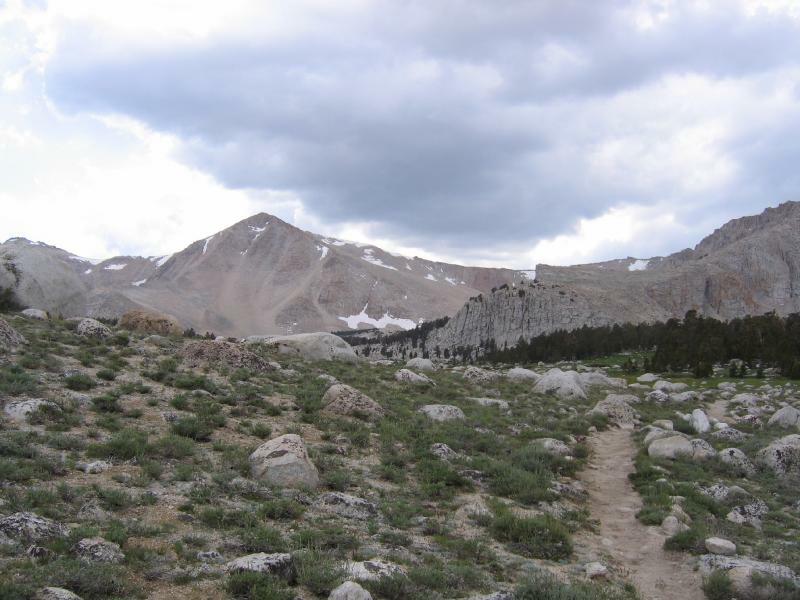 Across the plateau is Mt Langley, which is over 14.000 feet, very near as high and Mt Whitney. It was very beautiful and dramatic, though the clouds were hiding the sun. We decided to start back to the parking lot, for we were tired, and it was a long way to go. Just look at my sure footed wife! What stamina! There was a nice patch of sunshine as we neared the end of the trail. 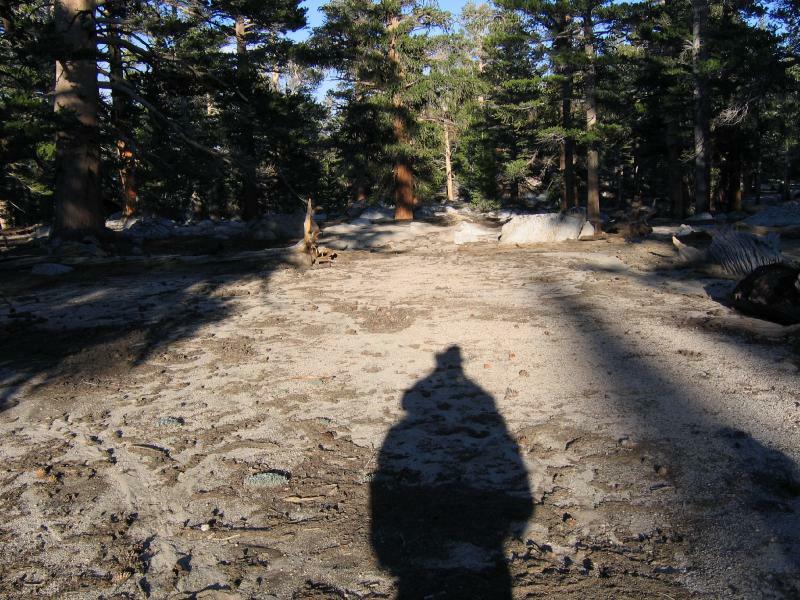 It was about 8 PM, and I took this photo to capture the long shadows. Beautirul colors looking toward the SE. 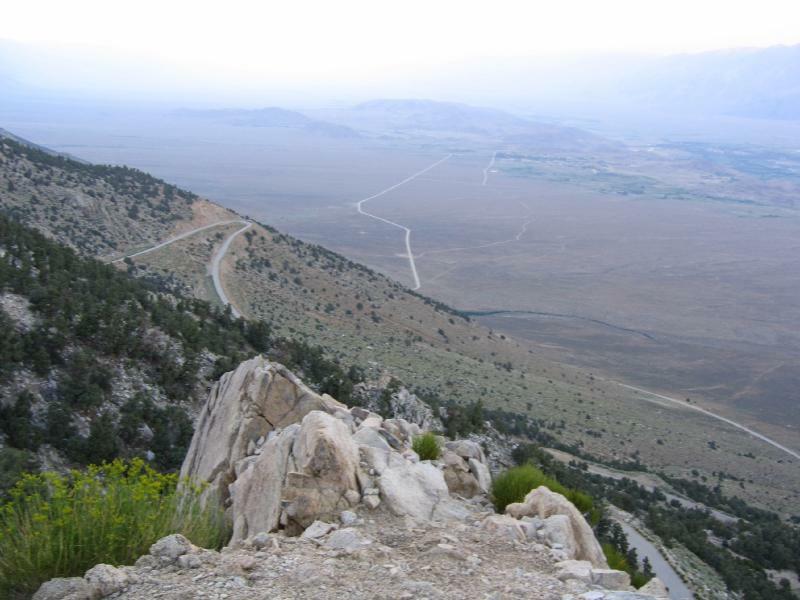 Hear you can see some of the switchbacks, and the road heading up the valley to the Alabama Hills and Lone Pine. 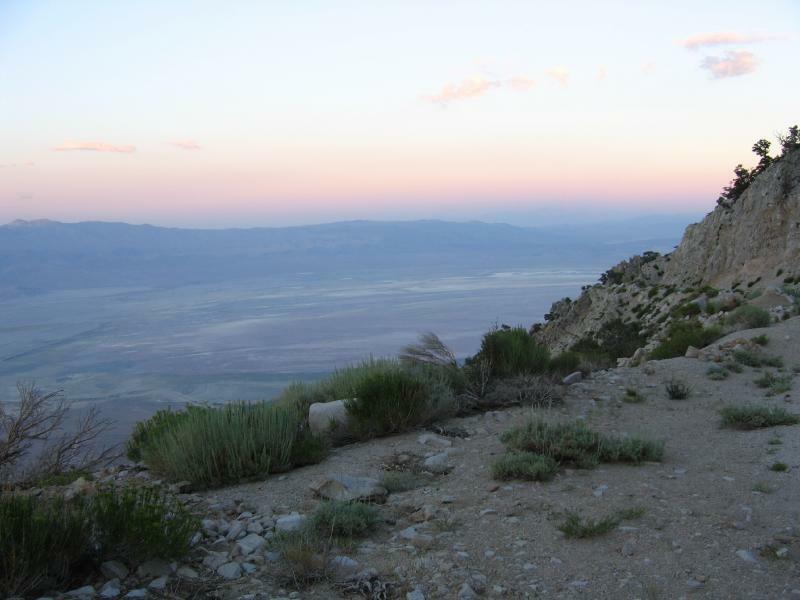 It was after 9 when we got back to Lone Pine. Whe had hot soup an desert in a nice diner and then drove about an hour up the valley to Bishop, where we had a motel reservation. We were tired bur very happy! What lovely pictures! Looks like you all had a wonderful time> I admire your stamina and agility!! wow, what a beautiful hike. 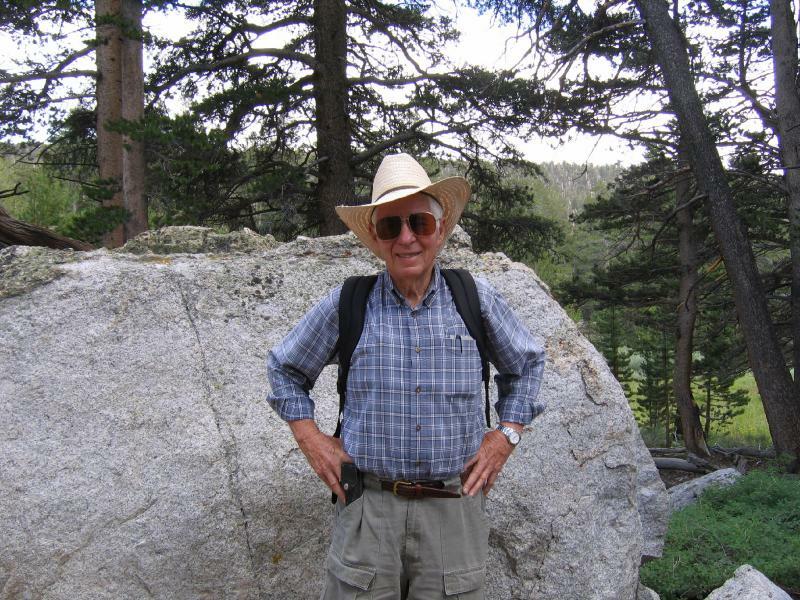 This was a great photoblog Grandpa, gorgeous pictures and I appreciate the commentary. Great photos and the commentary was especially good. I would have never guessed that Gunga Din was shot in California. Wow, great hike for you two mountaineers. I learned a new word too, "escarpment"! 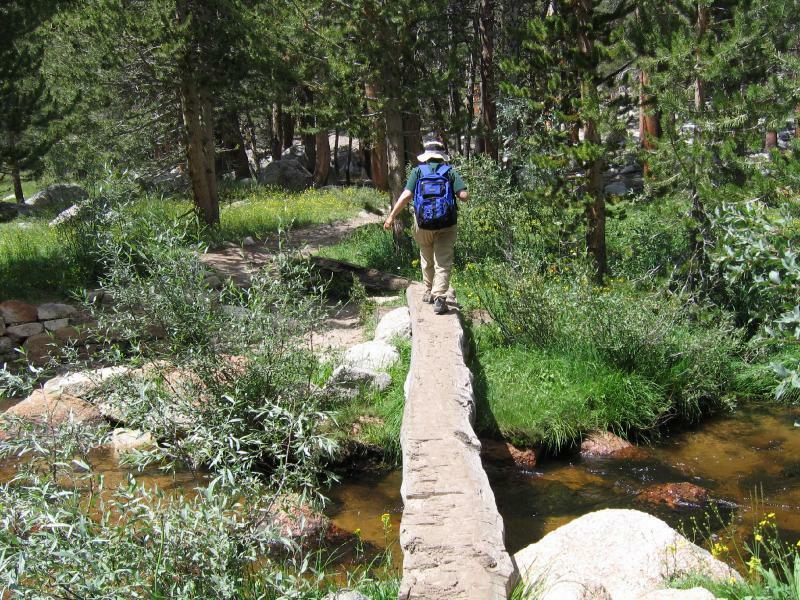 I'm still hoping to hike at Kirkwood this year! You both are incredible!! And soooo cute! I loved the picture of you two together! what a blessing to return to a place filled with memories and enjoy it once again!